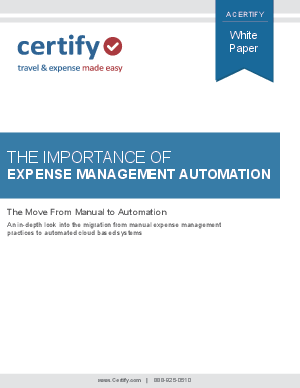 Despite the advances in technology and communication tools available to businesses, roughly two-thirds of companies still use Excel or pen and paper to manage their expenses. This creates a substantial labor and processing cost for each expense report. According to the 2011 Aberdeen Group Report, “Expense Management for a New Decade”, the cost of processing a single report for the bottom 30% of firms in the survey was $41.12, with compliance as low as 50%. Top rated firms - those in the top 20% using automated systems, spent as little as $7.17 per report and had a compliance rate of 87%. Expenses include hours spent by employees writing expense reports, hours spent by accounting processing and approving expense reports and the ongoing issue of compliance.